Affordable waterfront living at its best. 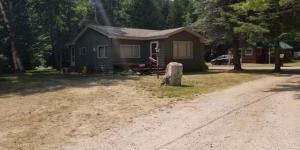 This quaint cottage, is located conveniently just north of Topinabee and south of Cheboygan. You are going to love the lifestyle that this home offers, at a very affordable price. Whether you want to spend the day on Mullett Lake, or traverse that nearby ATV and snowmobile trails, there is something for every outdoor enthusiast. This property can also be purchased turn key, allowing you to move in the day you buy it.